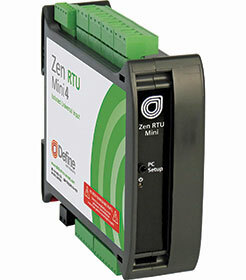 Define Instruments has released the Zen RTU Mini, a data acquisition unit for industrial analog signals. A breakthrough for DAQ applications requiring the collation of multiple signals and signal types from industrial sensors, the Zen RTU Mini collates up to 16 signals for direct routing to scada systems and PLCs. Running cables from sensors to DAQ units is expensive and reduces the portability of the application. As a remedy, the Zen RTU Mini has a wireless option so customers retain flexibility and are free from the cost of cabling. For optimum data acquisition flexibility the unit features universal input, accepting a wide range of signal types including thermocouple, RTD, mA, mV, V, frequency and pulse. This reduces the number of separate instruments required, further reducing costs and keeping things simple for maintenance and troubleshooting. Each input channel of the Zen RTU Mini is galvanically isolated, ensuring a clean and steady signal for high reliability in harsh industrial environments. Additionally the unit has four digital inputs and an RS-485 Modbus/RTU port. An Ethernet port can be selected as Modbus TCP. Cost-effective process monitoring and data recording.